I have a soft spot for Leonor Greyl hair care products. My first Leonor Greyl review was back in December of 2009! Besides the delightful aroma of each and every product, the results are what shine through. I was recently suffering from an itchy scalp and as soon as I used the Regenerescence Naturelle, I felt immediate relief. The Shampooing Au Miel lathers up nicely and makes my hair soft and shiny. I have not used the Complexe Energisant because I am saving that product after I have my baby. Unfortunately, I hear that is when you lose most of your hair- ugh! Another product I am looking forward to using is the Mousse Douceur Fleurs D'Oranger *Baby*. It is not featured below, as sweet Elizabeth was kind enough to send the extra because she knows I am pregnant :) Hi Elizabeth!! This product is Hypoallergenic, compact foam, perfumed with genuine orange blossom. It cleanses and protects the baby's skin and hair without stinging the eyes. It retails for $37. 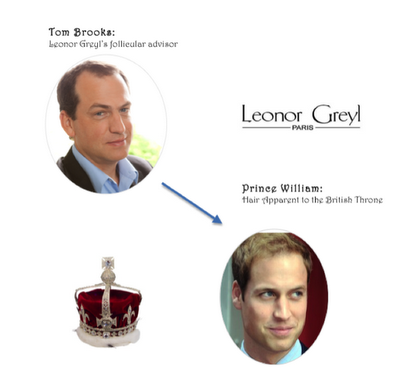 While royal wedding watchers may be speculating about Kate Middleton’s dress, there are others keeping tabs on the hairline of the next heir apparent. Stressful events (like planning the biggest royal nuptials since Posh and Becks) can cause hair loss, but the groom can thank genetics for the state of his crown. And he’s not alone: The American Academy of Dermatology estimates that 80 million men and women in the U.S. suffer from hereditary hair loss. Tom Brooks, the director of R&D for Leonor Greyl, says that no matter the root of the problem, Leonor Greyl’s line of topical treatments can offer hope to those experiencing thinning. At six-foot-three, William is the tallest Royal, and won’t be bowing his head to many, so he can keep his hairline out of most sightlines. But on April 29th, his crown is sure to be captured from many angles. Without some intervention, the young prince may have no hair to the throne by his 30s. But Leonor Greyl has treatments that can restore the crowning glory for anyone courting baldness. 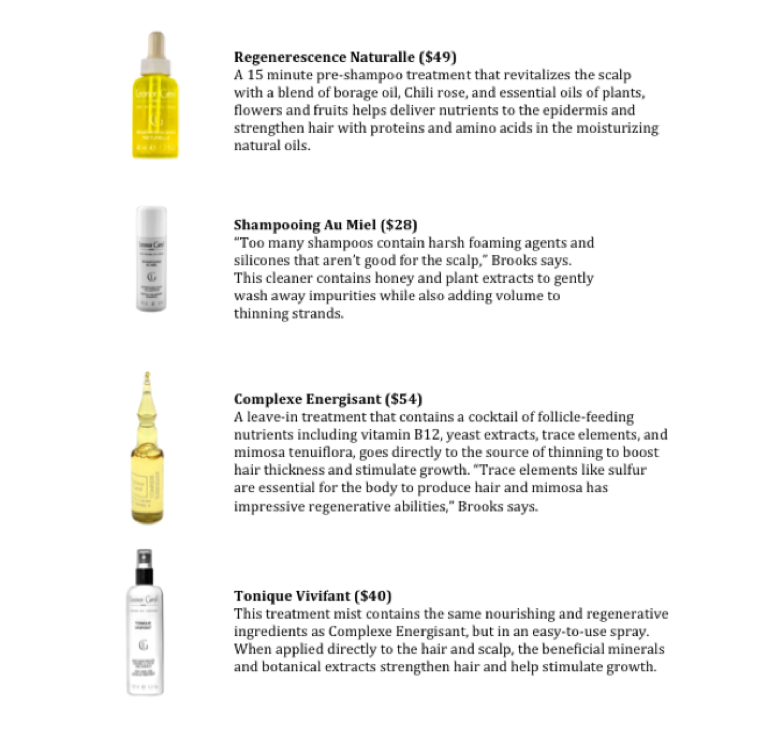 A pre-shampoo treatment of essential and botanical oils. Increases surface blood and circulation, preventing deficiencies of the scalp. How to use: Apply to dry scalp by section and gently massage in. leave on for at least 15 minutes or overnight if desired and wash out using the shampoo or treatment suitable for your hair type and scalp condition. It restores flexibility, shine and volume, uniquely enhancing your hair's beauty. This product can be used daily. Ideal for family use. How to use: Apply to wet hair and emulsify using small amounts of water. When a gentle lather builds, rinse thoroughly. We recommend the application of Huile de Palme prior to shampooing to help detangle and nourish hair. An energizing and leave-in treatment for hair loss. This product provides effective action against almost all factors responsible for hair loss. How to use: After you shampoo, condition and towel dry, apply strip by strip to clean scalp. Do not rinse. Use three vials per week for three consecutive months for severe hair loss. Use one vial per week for moderate hair loss. Every day hair loss leave-in treatment spray. This easy-to-use product is the convenient solution to fight hair loss and improve hair vitality. 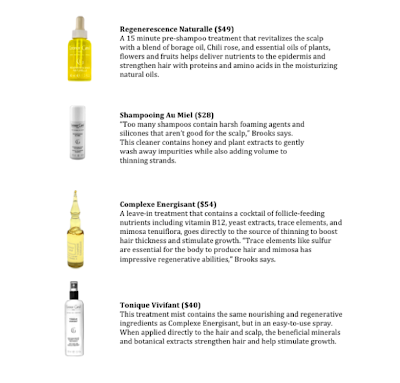 How to use: After you shampoo, condition and towel dry, spray product evenly on the scalp strip by strip. Massage scalp gently and style.